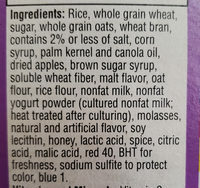 Ingredients: Rice, whole grain wheat, sugar, whole grain oats, wheat bran, Contains 2% or less of salt, corn syrup, palm kernel and canola oil, dried apples, brown sugar syrup, soluble wheat fiber. 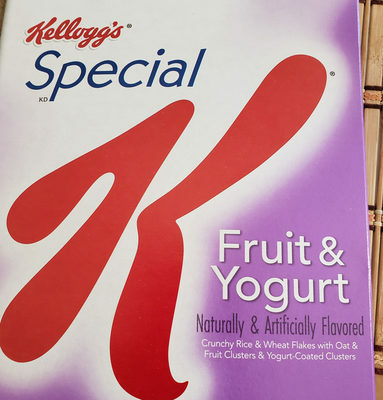 malt flavor, oat flour, rice flour, nonfat milk, nonfat yogurt powder (cultured nonfat milk; heat treated after culturing), molasses, natural and artificial flavor, soy lecithin, honey, lactic acid, spice, citric acid, malic acid, red 40, BHT for freshness, sodium sulfite to protect color, blue 1. 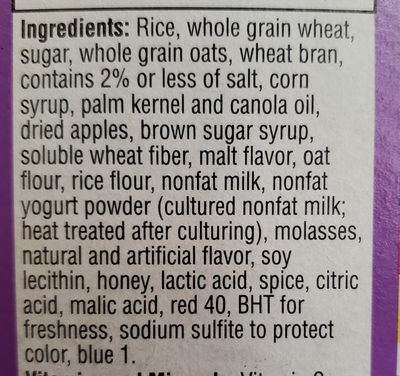 Product added on September 10, 2018 at 9:15:19 PM CEST by labeleat. Last edit of product page on September 10, 2018 at 9:15:39 PM CEST by .